Burgers and fries are the perfect match, and the only thing better than traditional potato fries are sweet potato fries. They are seriously amazing (and healthy), and are sure to be a tasty win-win combo in your kitchen. Don’t forget to share the moment #youplateit with us on Facebook or Instagram! Peel and mince garlic. Thinly slice pickle. Peel red onion and slice as thinly as possible. Cut sliced cheese into quarters. Set aside. Pat dry beef mince with paper towel and add to a bowl or plate. Add minced garlic and season with pepper and a ¼ teaspoon of salt. Mix by hand to combine. Form evenly into 6 beef patties (about ½-1 cm larger than the slider bun). Use a spatula to flatten evenly then create a dimple in the centre of each. Lightly drizzle with olive oil. Heat olive oil in a large pan over medium heat. When oil is shimmering, add patties and cook until browned on the bottom, about 2-3 minutes. Flip patties over, top with sliced cheese. Cook until patties are browned on outside, about 2 minutes more. Transfer to a plate and loosely cover with foil. Note: If you prefer to cook the red onion, lightly cook it now. Cut the slider buns then arrange, cut sides up, in a single layer on a baking tray (use 2 trays if necessary). Toast in the oven 2½ minutes, or until the edges are golden (Tip: be careful not to burn as they will toast quickly). Transfer to a clean, dry work surface. Add as much ketchup as desired to each bun and top with the beef patties. Add sliced pickles and red onion (using as much as desired). Top with the bun. 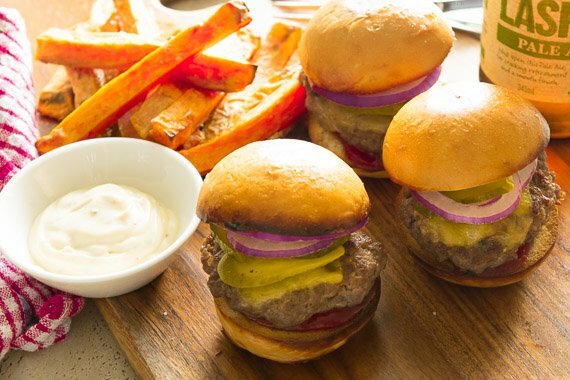 Divide assembled sliders evenly between plates and serve alongside sweet potato fries, and seriously good garlic aioli. Enjoy!